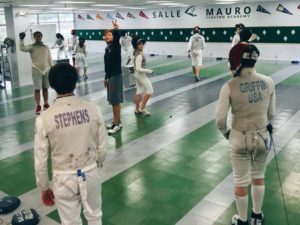 Salle Mauro Fencing Academy is one of the nation’s largest and most successful fencing clubs. 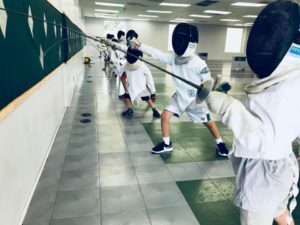 Our Recreational Fencing Summer Camps for beginners are unique, athletic, and fun all summer long! Our indoor program features World Class instructors for kids six years old and up who are interested in the exciting world of swordplay. 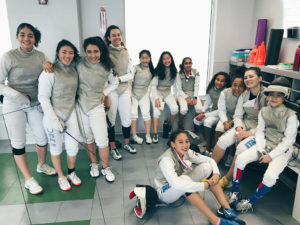 Fencing is a fast-paced athletic sport that uniquely blends the mind and the body, increasing physical fitness while also developing the ability to solve problems and make sound decisions. It’s a perfect summer sport for kids! Completing a camp session automatically qualifies you to receive 50% off our youth classes for one month. There is also a 10% family discount for siblings! *Camp Funtasy is only available in Salle Mauro’s Houston Location! Every year our camp attracts special guests from Italy, France, Japan, Canada, Chile, and Egypt to train our fencers. Join some of the top U.S. International Fencers and Coaches in our Intensive camp before Summer Nationals. Camp Victory welcomes everyone, whether they are competing at Nationals or are in the intermediate level seeking more knowledge about the sport of fencing from experienced fencers and coaches, Our camp has been motivating fencers for the last 20 years to reach their top peak performance before competing at Summer Nationals. Every year our camp attracts special guests from Italy, France, Japan, , Canada, Chile, and Egypt to train our fencers. Join some of the top U.S. International Fencers and Coaches in our rigorous camp before Summer Nationals. Salle Mauro Fencing Academy would like to invite you to our annual Pre-Season camp. Join us for conditioning, technical and tactical drills, and extensive bouting. Coaches will work in groups and individually to help prepare you for the second half of the season. Join top rated national fencers for our Pre-Season Camp. Salle Mauro Fencing Academy would like to invite you to our Annual Winter Camp. Join us for conditioning, technical and tactical drills, and extensive bouting. Train with top rated international and national fencers for our Winter Camp. How old do I need to be to take a class? Our classes vary in ages and skill level. Kids can join our classes as early as three years-old as well as adults of all ages and skill levels. Anticipate to arrive 5-10 minutes earlier than the start of the class. What should I bring to my first fencing class? You should bring a beverage of your choice. Can I tryout the class before I sign up? Yes, Beginner fencers are eligible for a one-time free tryout session prior to signing up. How long does it take to move to the next level? Does fencing offer PE Credit? Yes, We do offer PE Credit for fencers of all levels. 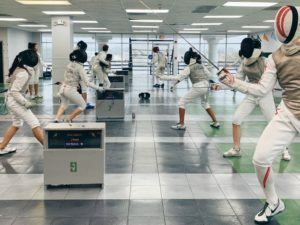 Can Fencing help my child get a college scholarship? Yes, We host birthday parties usually on weekends for ages four and up. We have been hosting several awesome birthday parties at our facilities for varieties of ages from children to adults. Are there any fencing classes and competitions for adults? Yes, we offer adult classes twice a week. Our adult team competes locally, nationally, and internationally at various competitions. Fencing is a lifetime sport that everyone especially adults enjoy since it challenges their body and mind. Do you offer team building events for businesses? Yes, we offer team building for large groups who are looking for a fun and unique way to bond with their co-workers, boss, and friends. © Copyright Salle Mauro Fencing Academy 2019. All Right Reserved.